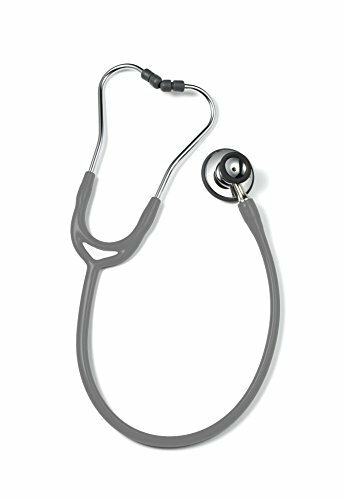 A premium stethoscope engineered and handcrafted in Germany featuring a dual-head brass chest piece that can be used for auscultation of both higher and lower frequencies in all specialties. Providing outstanding sound transmission, the outside rim and hard plastic diaphragm protects the highly sensitive internal copper-beryllium diaphragm - and the space between them has been carefully calibrated to provide extra resonance for pre-amplification. Excellent for providing a confident diagnosis. Highly glossy polish and chrome plating with no open micropores. ✔ UNMATCHED SOUND PRECISION: The ERKA Precise Stethoscope features a dual-head brass chest-piece that can be used for auscultation of both higher and lower frequencies. Optimal performance in cardiology and pediatric use in adults, children and infants. ✔ A CARRYING CASE FOR PROFESSIONALS ON THE GO: It comes with a functional carrying case which is perfect for medical workers on the go. ✔ ERGONOMIC AND FUNCTIONAL: The ergonomically shaped chest-piece enables auscultation even in hard-to reach areas or for different constituted patients. The super-soft ear tips will cancel outside noise and will be kind to your ears. ✔ FOR ALL SPECIALTIES: Anesthesiology, cardiology, pediatric care, emergency physicians, paramedics, family physicians, internists, physician assistants, medical students, nurse, aenesthetists/caregivers, and specialists in respiratory diseases. ✔ HIGHEST QUALITY: Made in Germany by ERKA, a 133 year old company which is a leader in precision-driven engineering. The pore free chromed brass surface is more resistant to bacteria. Classified as Dermatologically safe, washable with all common medical soaps. If you have any questions about this product by ERKA, contact us by completing and submitting the form below. If you are looking for a specif part number, please include it with your message.